The best storage pages for stereo slides! Our custom-manufactured slide storage pages made from 10-mil polypropylene are the best way to keep your slides safe! The pages are 3-hole punched to store in a binder, or they may be hung in a filing cabinet. The frosted back allows easy freeviewing by holding the page up to almost any light source! Each page holds 10 Realist format (1-5/8”x 4”) mounted slides). 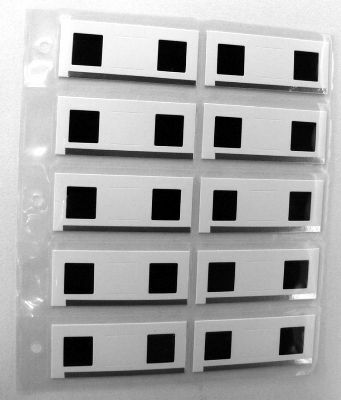 Perfect for cardboard or RBT-mounted slides! New! 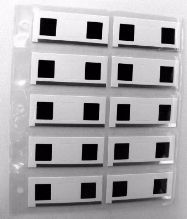 For your convenience, we now also stock slide storage pages for your mounted twin 2x2 stereo pairs--also great for all storing your cut but umounted slide chips!